The other day we started posting the rankings of the top 50 Steelers. Click HERE to see numbers 50 to 45. Today we continue with the next five players, that being numbers 44 to 40. Last season Dixon fell into the starting QB role after Byron Leftwich was hurt in the last preseason game vs Carolina, and he didn’t exactly light the world on fire. Against the Falcons he went 18-for-26 for 236 yards with a pick, and then the following week he was just 4-for-6 for 18 yards vs the Titans before he got hurt. He never saw the field again, and was eventually placed on IR. With a spot to step up and make an impact, he fell flat. His future is murky at best with the Steelers. The 4th round pick of 2008 played in one game in his second season after being inactive for every game as a rookie. Then in 2010 he appeared in four games, doing little to make a big impact on the roster. He is going to have to fight to make his way on the 53-man roster in 2011, and if he doesn’t, this will be his last camp for sure as a member of the black and gold. The 2nd round (20th pick) of the Steelers in 2010 didn’t get a ton of playing time as a rookie, but showed some flashes, more so on special teams where it started for some former great Steeler linebackers such as Jason Gildon. In 14 games he had 17 tackles and two sacks, and made some big hits on kickoff coverage as well. Showed some speed off the edge, and filled in nicely when needed. He appears to have a bright future in Pittsburgh. 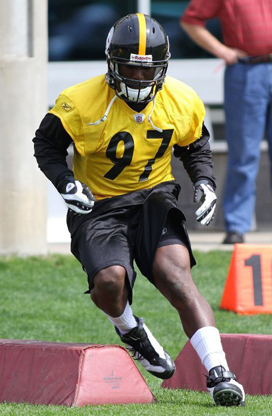 A 6th round pick of the Steelers back in 2008, Mundy played in 16 games in 2010, and made 23 tackles. He has yet to record his first career pick, and also has been picked on at times at the safety spot. His spot on the roster seems to be pretty secure for now, but at the same time, he can’t get lazy as he is going to need to keep getting better in order to get playing time. This journeymen DE has been back and forth on and off the Steelers roster, but seems to be a favorite enough of the coaches to stick around. Was on the team back in the Super Bowl years of 08 and this year, and this year in 16 games had two sacks to go along with 16 tackles. In four seasons with the Steelers has given them some needed depth on the defensive line. Should Vic Beasley Be At The Top Of The Pittsburgh Steelers Draft Board?